SRG’s Live Virtual Classroom training programs offer effective, affordable and convenient online skills based sales and management training for companies looking to improve their sales performance. Utilizing live facilitators in a state-of-theart virtual classroom training platform, our online sales training programs are perfect for distributed sales teams or teams that need to minimize time out of the field and maximize their sales training budgets. Live Virtual Classroom training courses feature highly engaging facilitators, limited class sizes and innovative instructional design. All programs are based on SRG’s award winning curriculum and include participant workbooks, field work, sales tools and planners. 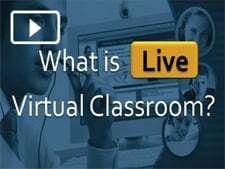 What is Live Virtual Classroom? Traditional “event based” sales training – i.e., multi-day out of the field training events in which participants are overwhelmed with information—typically result in poor retention and low real world skills application. SRG’s Live Virtual Classroom programs result in better retention and skills application by spacing out the training. Online sales courses are broken into weekly live virtual sessions, each session is a manaeable block of time. In-between sessions, participants apply the skills they have learned in the field. Over the course of several weeks, participants learn, practice and apply the new sales skills, get coaching and reinforcement from the facilitator and share best practices with their peers.